I’ve been a bit absent recently, I’ve been wildly busy dancing with aliens and building underground tunnels ready for when the Earth’s surface turns to fire. Today I have a fever, so I’m taking a break from all of that to introduce to any of you who don’t subscribe to Samantha Henthorn’s blog, a chapter from her just released book, because I thought it was great. I love its energy and strangeness. For some reason I couldn’t get it to reblog, so I’m just going to post an extract with a link. Go and have a look at the whole chapter, plus the new one that’s just gone up, they’re ace! Or just buy the book, go on! Note: any incoherence in this post is due to the fever, and not due to incompetence, for once. Things were really not going well in Edith and Edna’s search for a todger. I mean a lodger. Wantha and Toonan were the first of a long line of unsuitable potentials. First, there was the woman Edna was convinced she had seen on the reality eviction programme. Then there was the man Edith thought had a liking to one of the mug-shots of local ‘wanteds’ from the local paper. Then there was the family with all their belongings squashed into checked launderette bags. It took all of Edna’s posh-voice-strength to explain that the room was for single occupancy only. ‘For goodness sake! Please stop unpacking your chattels!’ She had screamed. Of course, Ricky Ricketts heard on Wantha’s grapevine that his mother had a room up for rent. He appeared in the vestibule of number one, Curmudgeon Avenue on a day where the sky looked like porridge. Skies, of course, do not really look like porridge. Unless we are talking about the sky on one of Edna’s pieces of art, a painting that she painstakingly continued with when she heard Ricky Ricketts’ voice. ‘Curmudgeon Avenue; The Harold and Edith Adventures’ will be released later this year. These are the second two reviews I promised, again, by two of my favourite bloggers. Firstly The Shameful Narcissist Speaks, link here, who writes about gaming, books and her own writing projects. If you’re a Final Fantasy fan, then you definitely have to pay her a visit. Or if you’re just fond of good writing and cats. Here’s her review. If you want to delve into the machinations of how a cult can draw in and take over “normal” people, this is the book you want to read. Looking at it from the outside, it’s easy to see what’s going on, but if you really want to believe something because you have nothing else, you will. That’s how these kinds of people prey on the most vulnerable. This novel is a disturbing journey, but that’s what makes it worth the read. And last but not least, Darnell Cureton’s Writing Block, link here, who writes stories and explores writing ideas, always an entertaining read. His latest story, The Dreamers Door was brilliant, a dark, twisting tale. And the review for my book! The novel PEDDLING DOOMSDAY by Petra Jacob is a fascinating read. It tells the story of normal people, like you and me searching for a better life. People searching for purpose, for meaning in their lives. Peddling Doomsday tells the story of vulnerable people recruited into a religious cult. Induction into The Center Of Truth is a gradual process. Our protagonist Deirdre, unhappy with her marketing job, starts reading their media: ‘Youdon’t know how significant you are. We Need You.’ In time she was convinced someone needed her for a higher calling. Psychology, emotional manipulations, and external stimuli inevitably convinced Deirdre and other followers to sever ties with the outside world. Isolation of recruits leads to reliance on ranking cult members like the Captain, as they are stripped of outside support. To prevent hiding behind your flaws, followers replaced given names with Cinnamon, Cabbage, Bear, Night and Torque. Cult jargon – Interference, Brilliance, The Shadows, The Elite, and Defts – only true believers understood the meaning. This cultivated a sense of exclusiveness among members. Everyone wanted to be a believer, to be in the inner circle. The story tells of Myra, the cult leader sharing the truth that has been revealed to her. She has the answers as to who is really running the world and why a great fight is coming. Deirdre begins to mentally question the soundness of the sect as she is instructed to perform odd rituals. Her paranoia increases while she tries to separate reality from delusion. This story is fiction, but could very well be today’s reality. For that, Peddling Doomsday gets 5 stars – or 5 spectacular Defts as I compel you to like this post. My book has been available for a little while now. I’ve had some great reviews, but a few have really stood out as my favourites, partly because the people who wrote them are some of my favourite bloggers. I’m going to repost two today, and two more later this week. If you think this sounds like a book that might tickle your fancy, it can be found here, for 99c or 99p. If you enjoyed Douglas Adams’ Hitchhiker’s Guide to the Galaxy, or Laline Paull’s ‘The Bees’ then this book will appeal to you. In actual fact, I am sure this book will appeal to you anyway when I finished reading it earlier today I thought, wow! That was amazing! I’ve just finished reading this book and couldn’t put it down. We get to meet poor Deirdre who is cajoled into joining a weird cult where everyone gets a new name apart from… well I wouldn’t want to spoil that bit it’s priceless! This dystopian mayhem tells of the wrongs of modern life .. I was reading and giving Petra Jacob an imaginary high five! Three word review: Social Networking lies! Then Jeyran Main, who writes honest reviews, that always show an insightful understanding of what she’s read. If you want the low down on what to read, she’s a great choice. 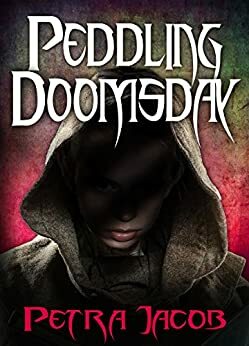 Peddling Doomsday is a psychological thriller written about a girl who joins a cult named the ‘centre”, in order to prove herself worthwhile. Once, she joins the group she realizes that not everything she has been told is the truth. Delusions begin to overtake her and she begins to question herself. I found the story to be exceptionally well written. I particularly enjoyed the strong female character side of the story and how complex a female mind can work, think, operation and feel. The author emphasizes more on the physiological aspect of the story yet made the book very thrilling to read. The path was not straightforward and the twists kept the reader intrigued wanting to know more. I believe every story has to always have an impacting side to it. A factor that influences the reader’s mind and makes the individual lose their selves into the adventurous path. This book did just that and by displaying the problems we could face with the modern living, I think it would suit most fiction readers. Peddling Doomsday – you can buy it from Amazon here! I’ve been squirrelled away and not visited my blog in a while, so I completely missed this review of my book Riddled with Senses by the truly delightful Shameful Narcissist. It’s such a beautiful piece of writing and totally captures the spirit of the book, so I wanted to share. 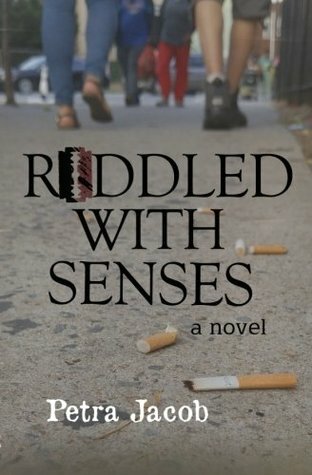 A tale of love, drugs, cynicism and magic set in the late nineties. It is told from the perspective of two seventeen-year-old girls, Jitty and Hazel; in the style of magic realism, where the grime of real life can be morphed by the characters’ imaginations. Jitty is a recluse who has created a world of magic to keep herself company. She secretly interferes in the life of the townspeople, including Hazel’s friend, Vurt. Hazel is a wild cynic on a course of self-destruction. Our benefit system is costing you more money by punishing claimants. The benefit system makes sick people sicker for longer, so they claim for longer. The benefit system creates benefit cheats. We all know that stress is a killer, but stress also makes sick people more sick, so they can’t work, for longer. I had a brain injury, but what really prolonged my ability to get better was extreme stress. The stress was rooted in the accident, however, I didn’t show any symptoms of it until I tried to claim for benefits and that was clearly a trigger. One of the most stressful things you can experience is to have your survival in the hands of lying, incompetent people who don’t think of you as human. The film explores how this feels, how it destroys vulnerable people, breaks them down. While claiming I found the system so relentlessly illogical and devoid of a duty of care that I became convinced that the government was trying to kill me, that was first sign of psychosis I experienced, after that it got worse. I was on benefits for six years, I think if I hadn’t been pushed to that point by the benefits system, if I could have relaxed, safe in the knowledge I was cared for and concentrated on recovery, I could have gone back to work in a year. This may sound like a one off extreme experience (or maybe melodramatic), but it has happened to every genuinely sick person I have known who has tried to claim; because all illness, mental or physical, is made worse by stress. And everybody, no matter how ill, goes through the same system of being treated like a scrounger, lied to, tricked, dismissed. Add to that the situations shown in the film – people being sanctioned and then not being able to eat properly or heat their home – all these things increase stress, prolong sickness and lead to the claimant needing benefits for much longer. The system is designed to be illogical and exhausting in order to put off benefit claimants. The problem with this is that benefit cheats have the mental and physical resources to deal with endless nonsensical and wrong instructions, they have the energy levels necessary to spend hours on the phone and they know the system so know just how to play it. People like Daniel in the film have never claimed benefits and don’t understand the system. They tell the truth (because they assume that is the right thing to do) and they are short on the strength necessary to play the game, all of which means they will not get money. As a result, many seriously ill people give up trying, they rely on friends and family to survive or they kill themselves (see below for some info about casualties). Dan sold his furniture and went hungry; and this is a seriously ill man who has just had a heart attack. I was lucky enough to understand computers (which Dan doesn’t) and I had a good friend to take over filling out forms and calling up advisers. Even with this help, I learnt that if I was to get money to live, I needed to change how I acted. Honesty and doing what I was asked to do, simply didn’t work. So I learnt to lie and cheat and manipulate, and that was how I got the money I needed to live. Which is where the problem lies for the tax payer: The benefits system creates cheaters because honest people don’t get money. And being a cheater doesn’t just go away when you get better. If you have ever had someone repeatedly screw you over when you are at your most vulnerable you will perhaps understand: it changes you, it creates a cynicism and an anger that don’t vanish, and cynical, angry people, who have learned to work the system, aren’t good for society. Calum’s List – an attempt to keep track of people who have died as a result of people beaten down by the benefit system. There’s been plenty written about Gone Girl, about whether it is feminist, anti-feminist, post-modern and so on, but I’ve not seen anyone talking about how it seemed to me – a story of domestic psychological abuse. The victim in the story is worn down, isolated and humiliated while the abuser is manipulative, controlling and demanding. However, this is not seen as a story of domestic violence because the victim is a man. For anyone who hasn’t read it, the tale is of a woman who marries her ‘perfect’ man and then tries to change him. When he doesn’t change in the way that she wants, she slowly destroys him; then disappears and frames him for her murder. The book is about him trying to prove his innocence. At first when they get together, Amy pretends to be someone she’s not (the ‘cool girl’) and when her real personality comes out – uptight, bitchy, controlling – he doesn’t like it and she takes this as a rejection and betrayal, for which he must be punished. From Amy’s point of view, she is the wronged party (which is common with abusers), she doesn’t accept that she started the relationship with a lie. Everything he does is taken as a slight. She sets him tests that he can only fail, and then instead of discussing it with him, she acts hurt; putting the blame for a situation she created, onto him. He learns to be constantly wary of letting her down, but her moods are so unpredictable, he can’t avoid getting things wrong. She isolates him from the people he loves, she belittles him until he starts to doubt himself. She slowly and deliberately breaks him, so that he becomes emotionally numb and dependent on her as the only one who can make him feel. If the genders were reversed, there would be no doubt that this was a well-written tale of abuse. I think we are reaching a point where it is acknowledged that domestic violence can include women being violent towards men, but psychological abuse towards men is never labelled as such,and is even made a joke of. If a relationship is manipulative and isolating, and involves the slow destruction of one person’s psyche, then it is abuse. More disturbingly, women are often encouraged in society to change the man they love. Instead of pursuing their own ambitions, they are expected to live out their dreams through their male partner. I’d have hoped this would have changed now that women have careers and passions outside the home, but it still seems to be a normal part of society. Of course, we all want to change small things about the ones we love when flaws affect us: persuading your partner to be a little more careful with money or a bit tidier; but these should always be minor details in a relationship built on genuine love and respect for who the other person is. And it’s a two-way street, a discussion, not a demand. If you genuinely don’t think someone is good enough for you, if you don’t respect their hopes for the future, then don’t marry them. Trying to ‘change your man’ to fit your own ideal is abusive. “You were always intended as a project. I married you because I thought I could make you into something great. You’ve failed me.” To her, this is completely reasonable. Sadly, he now sees it the same. Until we recognise that women can be perpetrators of abuse and that that abuse does not have to include violence, there will be no chance of stopping it. If we want equality then we must recognise that men can be vulnerable and that a relationship is about mutual respect and acceptance of each other’s failings, as well as a celebration of our differences. I think Gone Girl highlighted this brilliantly, it seems a shame that no one picked up on it. *I feel I need to explain, my friend is not a submissive or weak man, he has always been funny, confident and tough. To look at him you would never think him a victim. I’ve found this is often the case with abused women also, it seems that if you and everyone else believe you can’t be a victim, then you are more likely to become one. Perhaps because your abuser’s interpretation that they are the victim fits better with your belief that you are strong. The characters aren’t just copies of other TV characters. There are plenty of tropes in there – the dumb jock, the nerdy boys, the weirdo loner, the good girl who falls for the dumb jock – but each character gets to defy the rules and this makes them seem more like real people. Some of the defiance is dramatic and delightful, such as good girl Nancy being kick arse with monsters. Some of it is quite small, such as little comments or expressions, but these small differences help give us a sense of the characters as proper humans. This also makes the series scarier because we genuinely empathise with the characters’ fear and want them to survive. It has real energy. I think this comes from the three boys, Dustin especially, but all of them to some extent. They charge around on their bikes, they get angry and shout, they come up with many plans, and they do all of it with such genuine enthusiasm that I find myself getting caught up in their excitement. By the time they reach the big monster showdown, I’m giddy with the drama and rooting for them. It has heart. Or rather, the characters do. I’m not talking the romantic plotlines, which follow predictable patterns, but the friendships between the four boys and eventually with Eleven. Also missing boy’s mum, Joyce (Winona Ryder) not only slings aside all pretence at sanity in order to find her child, but also the heartfelt scene where she reassures Eleven that she will be there for her. None of these moments feel insincere. These three elements don’t read as particularly significant, but because they tend to be missing from most television, they make the series stand out. All characters are unsurprising. TV characters have been copying other characters for decades now, in a process of ever diminishing returns. The result is a gradual simplification through repetition, until we have just a few possible characters with a very narrow range of behaviour. This doesn’t only involve the repetition of personality types that don’t exist much in real life (eg. The pretty but tough female cop who’s vulnerable underneath it all, the unnecessarily macho and wisecracking male) but goes right down to details like facial expressions (people on TV have very few), actions (also fewer than in real life, mostly just running, fighting, kissing and realising stuff) and normal conversations (there are none). Stranger Things only broke a few of these rules, but that was unusual enough to make it stand out. A lot of TV has a blankness to it. People run about, try to kill each other, cry and so on, but they’re missing energy, the feeling of genuine intent. I think a big part of this is the lack of facial expressions named above. The Killing (Danish version) totally flabbergasted me when I watched it, because of the range and depth of emotions that the characters showed; sometimes several emotions at once, just like real people. It was like listening to a symphony after only ever hearing a kazoo. Stranger Things doesn’t have quite that range, but characters like Dustin and Eleven both shone out. Eleven for the subtlety of what she was feeling, and Dustin for the sheer gleeful abandon that he showed. TV characters never show gleeful abandon, they’re too busy trying to look moody and detached. Characters have compassion for the other main characters only. I’m not saying that every character should be bursting into tears every time any stranger suffers, but they don’t even say thank you when someone has helped them or show polite sympathy when someone is unhappy. Most of the time they barely interract, it’s as if all subsidiary characters are only there to serve the plot and humanity is irrelevant. Which is fine, it’s TV, but it means that when characters do show genuine heart, it is incredibly effective, it makes us love them. However I think what people want is to see characters that surprise them, that they are able to form a genuine affection for because they actually seem human instead of blank replicas with only the emotional range of smileys.